The first day in the van, when I met Patt and Jason, they told me it was their first time dove shooting so I said to them that they are in the best place to learn and practice, always, of course, having fun! That morning I had planned to be at the office in the morning and then meet David at the field entrance, before climbing to the hills, because my car is a little lower than the Van we use to transport groups of more than 3 people. It was 1.25 pm when I reached the entrance to the field, just a few meters from the main route. And while waiting I thought, why not? It doesn’t seem to be in bad conditions; I’ll climb. So, the first thing I did was to call David to let him know, otherwise, he would be waiting for me without knowing that I’m already at the field. So it was then when I went up and left the car just 500 yds from where the camp was. About 15 minutes later David came, went up to the van and introduced me with the group. This time we had visitors from North Carolina: Jeffery, Mike, Patrick, and Jason. 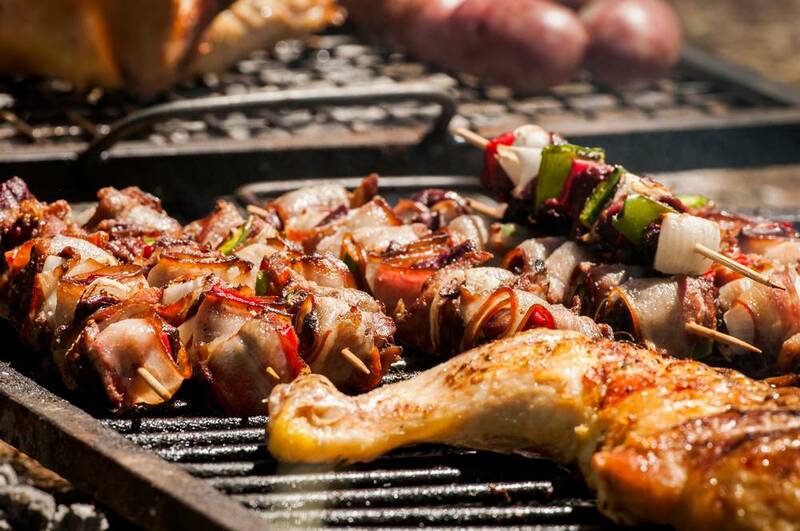 Once in the camp, Filo, our chef, was waiting for us with a delicious lunch with roast, chorizo (Argentinean Sausage), chicken and pork. I remember standing Jason finished eating and I was tired of sitting after 2 flights (although I also was anxious to meet the famous pigeons of Cordoba). AC-DC still sounded when after a quick lunch our friends started changing, leaving traveling clothes inside the van, in their respective bags. The real purpose of his trip will now begin: Hunting, drinking and having a great time. That afternoon Jeffrey Canarian was on one side of the mountain, while the rest would be more ventured into the mountains, being Mike the one at the highest position. 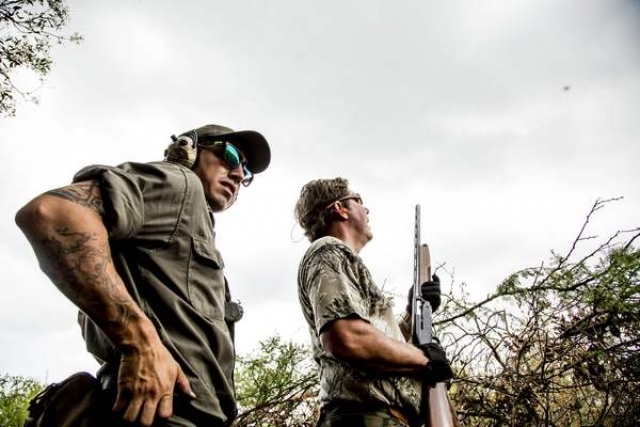 Jason was the first to finish his 20 boxes and Santiago, his field assistant, offered to open another case but, since it was Jason’s first time dove shooting, he had had enough by that afternoon (other than the second day that he would shoot more than 45 boxes). Then I went to Emmanuel and said to him “Ema, this is Patt, and it is his first time dove shooting… Can you guide him a little please?” and so he said “yes, of course, do not worry J, I will help him” (Ema was going to be Patt’s assistant). So it was; he took 7 or 10 boxes for Patt to start shooting as if he had already done it several times. That afternoon Patt throw 20 boxes killing a total of 201 pigeons !! Let me tell you something because watching how happy he was is the most rewarding thing about this job: to see our guests being really happy having a great time with his friends. Patt surprised us all, specially the rest of the group, because of the skills he had and how fast he was learning and shooting as he was doing (the second day, he achieved a total of 434 pigeons between morning and afternoon). The first day in the van, when I met Patt and Jason, they told me it was their first time dove shooting so I said to them that they are in the best place to learn and practice: you would see (just for the record, if we only take what Patt killed on the second day, it will take you 29 full days on the hunting season in the US to achieve what he did in just one day in Cordoba!) That evening Jason, Mike and Patt returned in the Van with David, while Jeffrey wanted to go with me since that day I had gone with my car. We chatted for a long time but when Jeff heard on the background the first chords of Daze and Confused, he turned up the volume to the maximum and neither of us could resist it; we started screaming trying to follow the lyrics. I still remember the face of Jeff surprised when we entered the car to the lodge. We joined the rest of the group and they were all saying thanks appreciating the excellent afternoon they had, because they had found everything above expectations. I remember the words of Jeff in the car: What is this man?, and I replied “This is your lodge, we are gonna stay here, this is gonna be your home for the next few days! And he could not believe his eyes! Too much ! The girls at the lodge were waiting for us with some juice and wet towels and after a bite, drinks and a great dinner with more and more drinks in the living room, we went to get some rest. On the next day, we had breakfast at 8 am, leaving to the field at 9 (although we expected to do it at 8:30, it was not easy to get them ready for that time). We all went up to the same mountain, but it was a different field. This time Chanqui, the photographer, came with us to document the day with photos and video. In the morning, we hunt near the camp, next to a small lake, where pigeons often go to drink water. Even though we know that the mornings are way different than the afternoons, they shot a total of about 65 boxes, being Jason the one that did the most with a total of 20. The dove was flying until late lunch. In fact, when the chef called us to eat, we were still hunting in place. They were shooting two guys together, but we were all there, putting together skills and waiting for lunch since we were just about 30 yds to the camp. Meat, meat ,and more meat with pears in red wine as dessert. Oh no, that’s fruit, no thanks. Just try it. Pears in wine with cream, ate everything, left nothing. Jason opted for a nap in the hammock while the rest decided to lay on the grass; Jeffrey was in charge of the music. I could see that the boys had already climbed to prepare the hunting positions, so I calculated that we would climb in about 5 or 10 minutes. Once in the hunting positions, I was surprised of how the wind stopped blowing because that morning had been very windy. Sunny but windy. Actually, the afternoon was very pleasant; a little breeze, not even wind. Patt and Jeffrey were the last to finish that afternoon and I could still see the dove flying on posts while we were in the Van toward the Lodge. Patrick was impressedwith the dish that night: a tasty lasagna with bolognese sauce. The next afternoon, Jason and Patt finished the day with the same number! yes, 366 doves each! Jason finished first while Patt was about 6 pigeons to reach him and he still had 10 or 11 cartridges. Unhurriedly, waiting for that best doves, he saw the ones that fit to reach Jason, and knowing that he had 2 chances to catch them, he saw a dove coming in front of him on the distance he liked and missed the first, but then, as soon as he saw the shotgun giving a little more swing and achieving impact with his last round, he reached Jason with 366 pigeons in the same amount of boxes: 30! That evening all the boys returned to the lodge in order to share the last great night together. Good music, drinks, chess, backgammon and more drinks. I’m gonna miss this guys, we had a hell of a time those days! Brad Meyer’s group arrived a Monday at 8.30 am to Cordoba’s airport where David was waiting to take them straight to the field. That morning the highway was quiet because it was a holiday in Argentina for San Martin death’s anniversary. José Francisco de San Martín y Matorras (25th February 1778 – 17th August 1850) was an Argentine general and the principal leader of the successful struggle for independence from Spain by the southern nations of South America. Celebrated on the third Monday in August, this holiday commemorates the death of José de San Martín since he is regarded as the most important Argentinian founding father, who liberated not only a part of Argentina but also helped liberate Chile and Peru along with O’Higgins and Bolívar. So, after an hour and a half of driving, they got to the camp and had lunch with another group of 8 people that had arrived 3 days before them and were leaving the next day. Right after lunch and a quick pause to get everything ready, David took them to the hunting spots, where the field assistants were waiting. 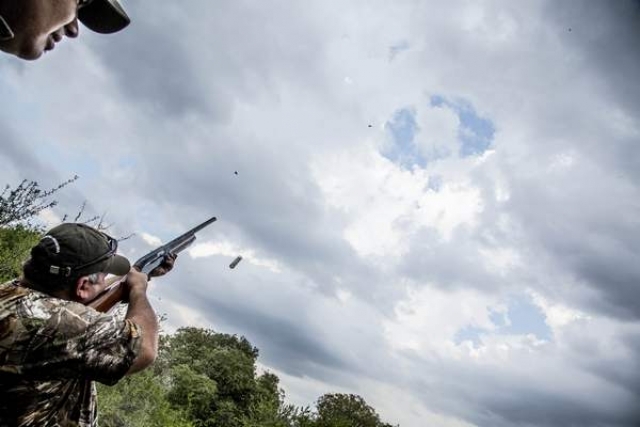 I wasn’t lucky this time because I couldn’t be that afternoon with the groups, but the guides told me that, since it was not windy and doves were constantly flying, it was an unforgettable afternoon hunt, mostly for someone that is in Argentina for the first time, knowing that Cordoba is the best place for dove shooting. That night I went to the Lodge to introduce myself to the group and to spend some quality time with them. We had pasta for dinner and then we went to the fire pit to enjoy that beautiful night, but just me and Steve were the only ones left after a couple of hours, since the rest of the group was really tired after 24 hours of non-stopping activities and, of course, because of all the traveling. The next morning, the group decided to stay at the lodge and relax a little bit. It was 10 am and everyone was ready. Some had scrambled eggs with bacon, others chose fried eggs with bacon, a cup of black coffee and a glass of orange juice. 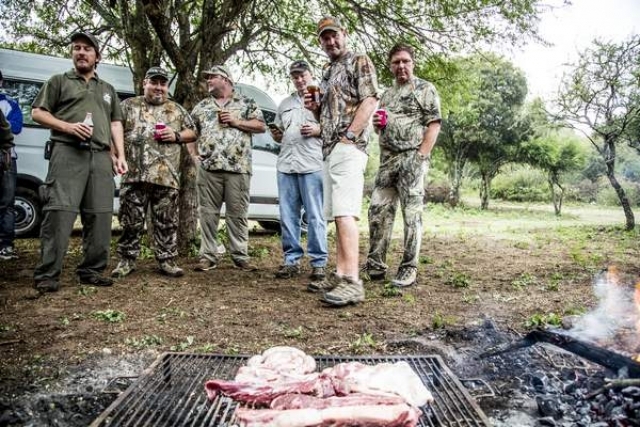 And then it was 10.30 am when I saw Martin arriving to the lodge with the Van to pick the leaving group up and, after him, I saw Facundo arriving too, looking for me and the group to take us that and the rest of the days to the field in a white Ford for 10 people. That afternoon we hunted in the hills, on a field located 30 km northeast from Villa del Totoral, town in which Plaza Real Lodge is placed. Totoral, as we call it here, is a town in the province of Córdoba, Argentina. It has 7,110 inhabitants per the 2001 census, and is the head town of the Totoral Department. While I was climbing the hill, I found the first hunting spot in which there was Brad with Juan, his field assistant. After 10 or maybe 15 minutes, we decided to move him to a different spot because, even though doves were flying great, they were unfortunately doing it too high and on a high speed because of the wind. 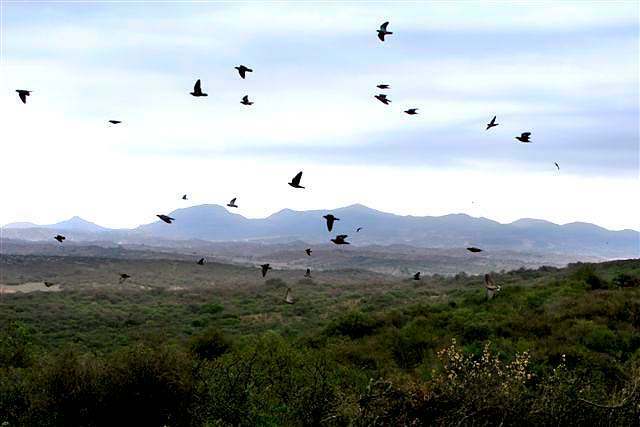 I kept walking, and I saw David and Juan in the second spot, cutting some branches to make a better spot for Brad, place in which doves were flying up on the flush of the mountains and coming across Brad, waiting for them around 20 to 45 yards away. After a little while, Brad gave me his shotgun and invited me to hunt a bit with him. I’m not going to lie, it was super fun, and I still remember when not only one, but two doves came closer to us trying to land on a branch in front of us and I just could not resist the temptation and that’s how, from one moment to the other, laughter and feathers appeared. I gently gave the shotgun back to Brad and, after I thanked him for inviting me to spend a moment with him, I left to check how the other guys were doing. I walked something about 80 yards and found Steve. I asked Santiago, the field assistant, how was the afternoon going on this spot so far and, before he could even answer, I saw a group of fifteen doves approaching us. Steve killed 3 in a row, and missed other four for just a centimeter. I decided to stay for about 25 minutes with Steve and Santiago to see how everything was going there. Then, I started walking uphill and I found Ricky and Emanuel on this amazing hunting spot of the afternoon since doves were flying low and slow. Ricky killed 345 doves that afternoon! At the top of the hill I remember I saw Shane, who was hunting with his field assistant, Facundo. After 15 or maybe 20 shots, we realized that doves were passing just behind a tree that was not too big, but really dry, so we offered Shane to take a little break of 10 minutes and to grab an ice cold beer while we cut down some of the branches of that tree. So that was how I climbed that tree and Facundo told me which were the branches that were bothering Shane. I stayed 15 more minutes with them and then I went down the hill where the last hunting spot was. That was the biggest of them all, and it had the advantage of being in the shadows and, even though doves were not flying straight, they were doing it from right to left and the other way around, but don’t get me wrong, it was full of doves still! I have met Mark on the phone some months ago. 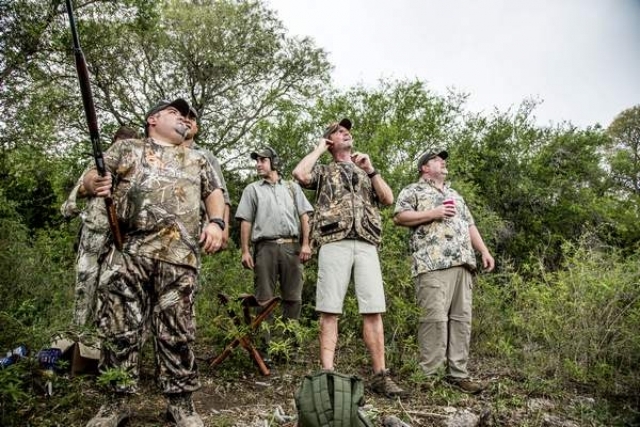 We have been in touch by email and we organize a dove hunting trip for October. It is difficult to meet people by phone, but we both have the same feeling: “This is a cool guy”. And we were not wrong. What a great group of people! 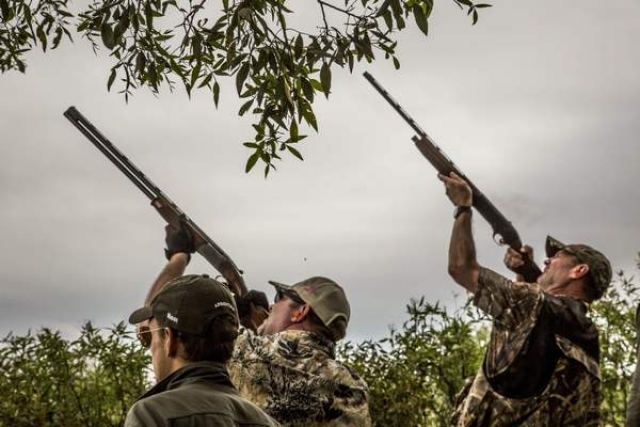 Dove shooting in Cordoba was great last week. 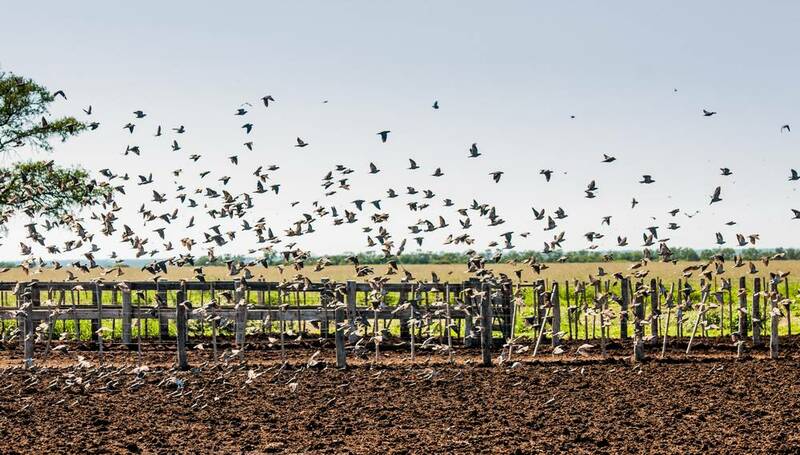 Most of our fields had amazing volume of doves, and the birds were flying almost all day long. “Tranquera roja” field and “Bernardo” field were amazing, especially with the new blind we set up in the hills for big volume and low birds hunt. We hunted there with Mark and his friends from Victoria (TX) and San Antonio (TX) having a great time. Our main goal was try to hit 25 doves in a row. Gabriel, known as “numero 1”, was loading Mark’s shotgun and I was standing behind him, when he asked me about where would be my next trip. I answered him: CUBA Chico! So we started dreaming about some amazing bonefish in the Cuba flats, tarpons and permits. One location, for amazing salt water fly-fishing. I explained Mark about the great options for fishing in Cuba and about the special fishing licenses that the US government authorizes for this specific purpose. He said: If you can make it, I´m in! We smoked 300 shells meanwhile we were talking about a trip to Cuba. Finally, I promise to send them a report as soon as I get back. At Pointer Outfitters we have a great deal on dove hunts, for those that purchase a trip to Cuba for fly fishing. You get a trip for free accommodations at Plaza Real Lodge open for 24 months after your fishing trip to Cuba. Can you believe it? Only with Pointer Outfitters. His friend Tucker walked to our spot, and we had changed the subject to dove hunting again. Now, it was competition time. We had to shoot 25 shells each for 20 bucks! And that was it. I will keep in secret who was the winner. Martin our head guide did an exhibition and showed his great skills. What is good about Martin is that he is proud to help and coach people in the field and he does it in a very humble way, and that is what people just love about him. 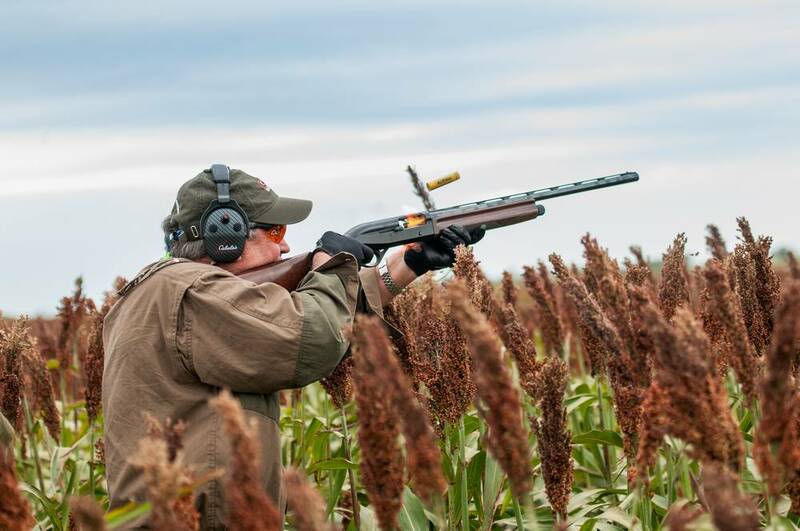 We should say, that most of our dove hunting days in October were great and with lovely weather. We had only one Saturday in the field where we got wet, just before lunch; but we were able to have a really nice barbecue at the field anyway. The rain was not that bad, that is why we always recommend our guests to bring a rain coat. 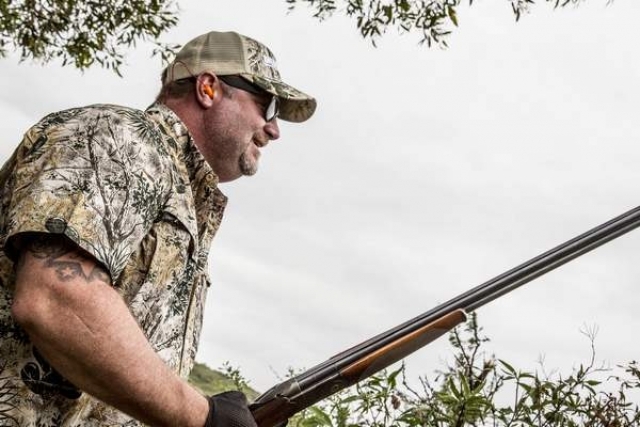 We tested the Benelli SuperSport Shotgun 12-Gauge, Chambered for 2-3/4´´ and 3´´, with Ultra-reliable Inertia Driven system, what makes a hole of a difference in Cordoba dove shooting. We all agree that the ComforTech recoil reduction system is great, and we would like to check how it works under pressure. Phil and Todd like the Ported Crio barrel with extended Crio chokes and the unique carbon fiber finish. 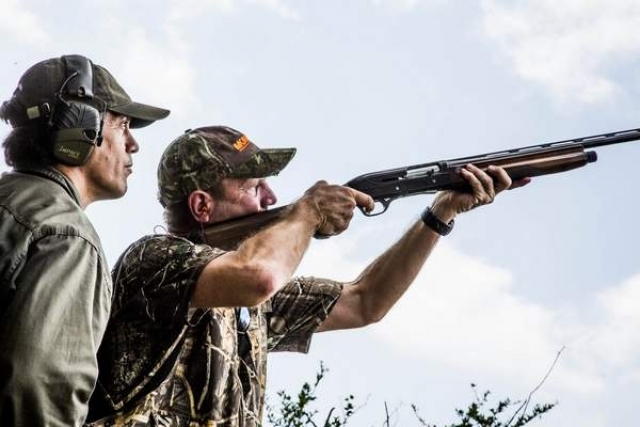 It is a very good shotgun for Cordoba dove hunt. 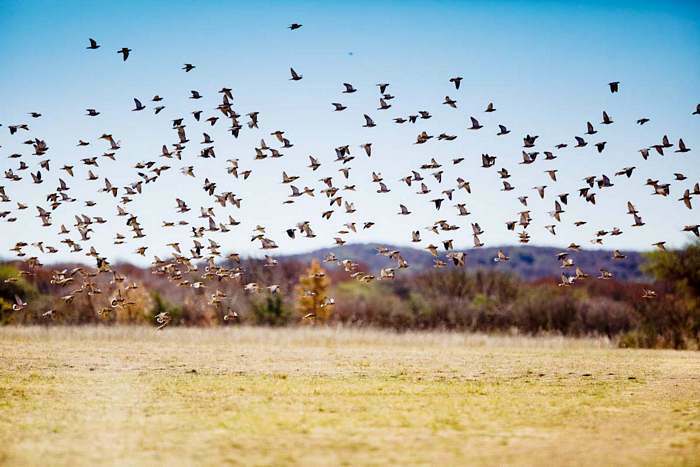 We hope you will enjoy it in your next dove hunt trip with Pointer Outfitters. In the fields, for the daily hunts, our crew tested the Toyota trucks. We have been in a new field with rocks and complicated roads and our trucks worked very good. The Toyota Hilux is a durable and great-value alternative, acceleration is impressive for such a large machine, and it’s more refined at a cruise, too. Hilux is all about function, with a standard four-door body and a large pick-up bed behind it. On the inside, the dash is constructed from hard, durable plastics, but quality and assembly are first-class. Great pick up for dove hunting in Cordoba! This was a special group. They had tons of energy, and after the hunts we were out at the fire pit for some drinks. We had a great night at Johnny B Good bar in Cordoba city, and we enjoyed some great double vodka with tonic and amazing appetizers. Gary said: “Tienes chile picante” and from that time, we always had some “chiles” and hot sauce for Gary. We enjoyed some of the best spicy dove breasts ever!! I have shot doves in this wonderful country on two separate visits to date. I would jump at he opportunity of returning as those of you who have already been will certainly echo. For those yet to experience the thrill of a lifetime my advice is do not delay!! The first time I was a little apprehensive – after all our countries had been at war back in the 1980’s – also I had seen the pictures of clouds of birds and was worried this would not be sporting shooting. How wrong could I have been on both counts??!! All the Argentinians I met were great people. Friendly and extremely hospitable to the nth degree, great sense of humour, cultured, hard working and such a pleasure to spend time with. Literally nothing is too much bother. I have made lifelong friends in this country and will visit them whenever I can. Is the shooting sporting? In a word ‘Yes’. 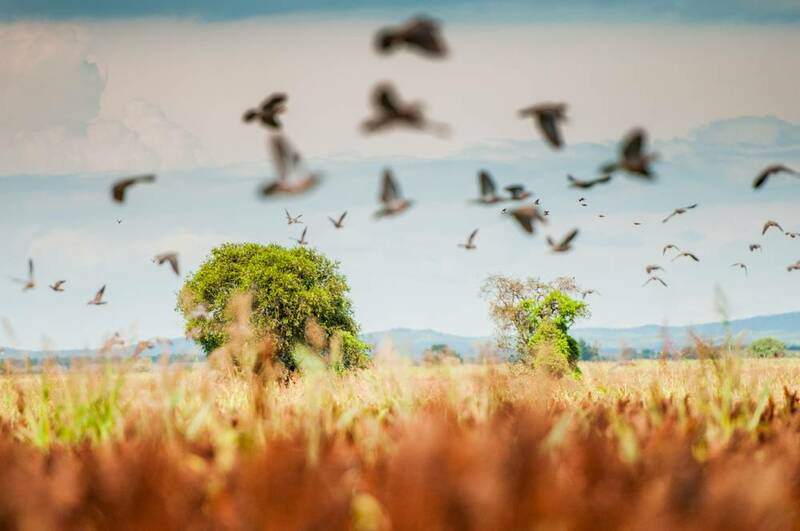 These doves are a regional pest and for sure at harvest time they swarm over the ripe maize. After an hours initial shooting under the watchful eye of a field guide, to assess whether we were competent and safe we requested more testing shooting and were immediately obliged. Soon we were stood in thorn scrub hides shooting at 50 to 75+ yard high or crossers. These birds fly fast and erratically, flaring left and right at a moments notice and coming from any direction. This is testing sport but those of you who need to build your confidence your guide will break you in gently with less rangy birds to start. Our preference was to use the estate Beretta Silver Pigeon over and under 20 bore shotguns with Fiocchi cartridges. Semi autos are available in 12 or 20 bore and if you prefer then the field guide will load for you. Not our thing though. Weather is invariably warm but not unbearably so. However the same cannot be said about the gun barrels as these will be scorchingly hot. So take a glove for the hand that will be in contact with them!! We shot approx 1250 rounds per day for four days with a kill ratio of just in excess of 50% which for testing birds is a very rewarding return. The field guides gather up the shot birds and prepare a good number for the field lunch with the remainder going to the local poor as a valuable food source. This is virtuous circle shooting if I ever saw it. You have a great sporting time shooting a pest species providing employment for local people and food for the needy. It is a win win win situation. 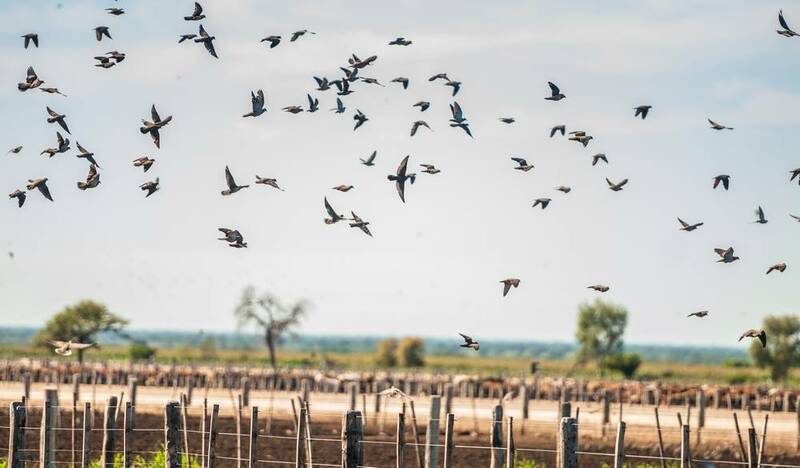 In the middle of the day the doves stop flighting between the roosting and feeding grounds for an hour or two and this is the time for the legendary field lunch cooked on the Asado grill and then a siesta. 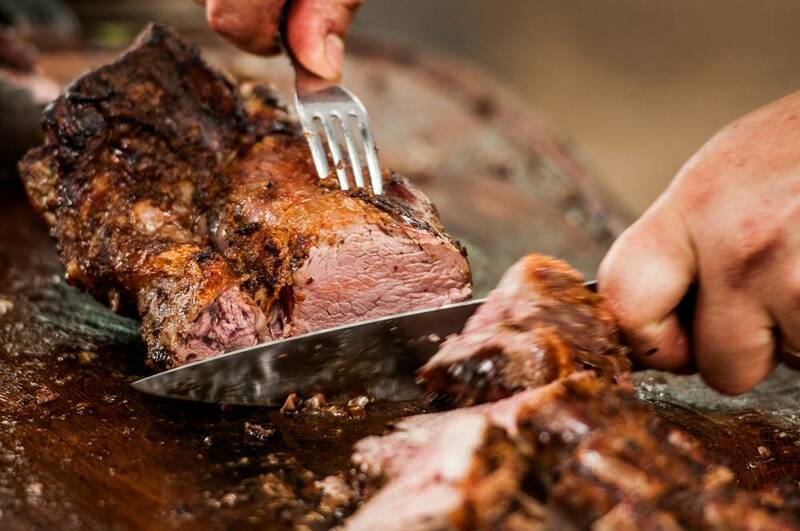 The food is outstanding, great meat, fresh salads and superb Malbec red wines. There is great banter and swapping of stories and just a few practical jokes!! especially where Pablo is concerned. At the end of each day in the field you will return to the lodge where the hospitality continues for as long as you may care to stay awake. After a good nights sleep in the great beds and a simply lovely breakfast you will be raring to get back into a hide and start shooting again. Pablo is a multi talented man – a super host, great shot and fisherman, practical joker and entertainer. He will have thought of everything and made sure it has been sorted and always with a smile on his face. I would stake my life on stating that you cannot fail to have a wonderful time in his company. There are few people in this world with such polished people skills as Pablo. What most does not write about is the overall experience. What I mean here is the lodging, food, guides, bird boys, field lunches, drives through the countryside… Soak up some relax time and get away from it all. The outfitters attitude is always positive and everyone will go out of their way for any request you have. The guide and bird boys take their job seriously and will make sure you are taken care of and in the best possible spot. Expect to hear “Bueno” and “Si Senor” a lot. Bueno every time you kill a bird or hit feathers (muerta en la monana). Si Senor – another cerveza, mas cartuchos, more steak, more wine, more, more, more. Dove is not the only item of excess. First class accommodations all the way from the sheets to the wine. Typical day – 1) wake up leisurely, 2) breakfast made to order in additional to the smorgasbord of fruit, toast, ham, cheese, cereal 3) load up and drive to the field, which are different each day. Your bird boy will be waiting and already have your spot ready to go. Shoot all morning until you have had enough or lunch. 3) Field lunch – This is where Pablo can shine with all his BS. 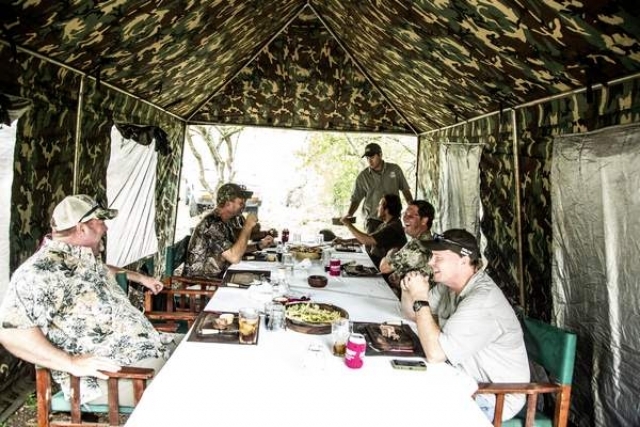 Safari tent, linen table cloth, another smorgasbord of grilled meats and wine complete with homemade desserts. Siesta time in hammocks come after lunch. 4) Afternoon shoot – in my experience the afternoons usually have better hunts (better meaning higher volume). The doves are finished with their day of eating, drinking, and loafing so they ALL head back to their roost wave after wave. Guess who is waiting for them on their return, a hunter who just had a power nap still feeling the buzz of tenderloin and vino tinto!!! By the end of the afternoon, friends have gathered together to cheer each other on or invent some shooting contest as well as to have a few cold beers together. 5) Back to the lodge. A waiter will greet you with your beverage of choice upon arrival. Unload your gear and meet by the fire and appetizers are served. Enjoy some relaxing time and tell tall storied of the day’s events before another smorgasbord of dinner followed by another round at the fire before off to bed. 6) Guess what, you get to do it again the next day. Man, I wish I was there now.